Wash the greens, slice the cucumber, finely cut the green onion. Make the dressing by whisking all ingredients together. Pour the dressing over the salad, and arrange salad on individual plates. Top with seaweed salad and black sesame seeds, if using. Sear the tuna over medium-high heat in sesame oil for 1 1/2 min each side. Done! Season with salt & pepper. Slice the tuna and serve on top of the salad. Add edamame if serving for dinner. 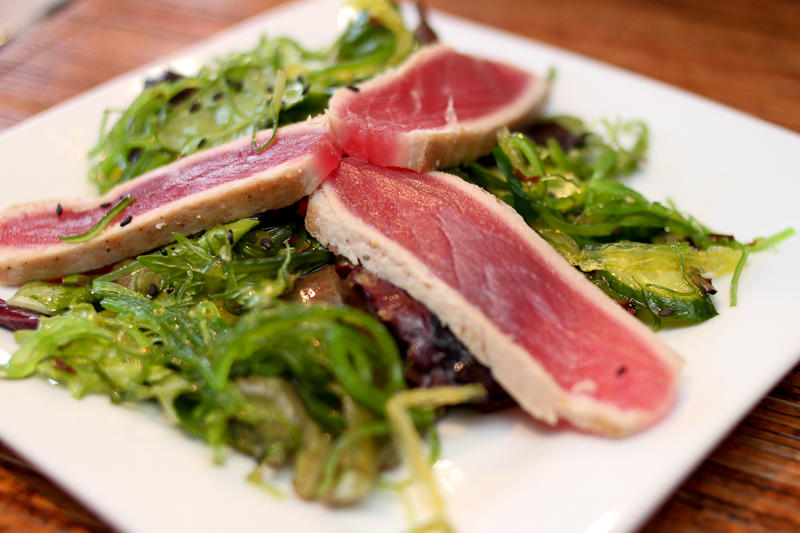 This entry was posted in Asian inspiration, Dinners in 30 min or less, From the sea and tagged Dinner in 30 min, seared tuna, stine lavigne, tun og tang salat, tuna and seaweed salad, tuna with wasabi dressing. Bookmark the permalink.